Heavy-duty trucks just unlocked a new achievement: 1,000 pound-feet of torque. This is absurd. 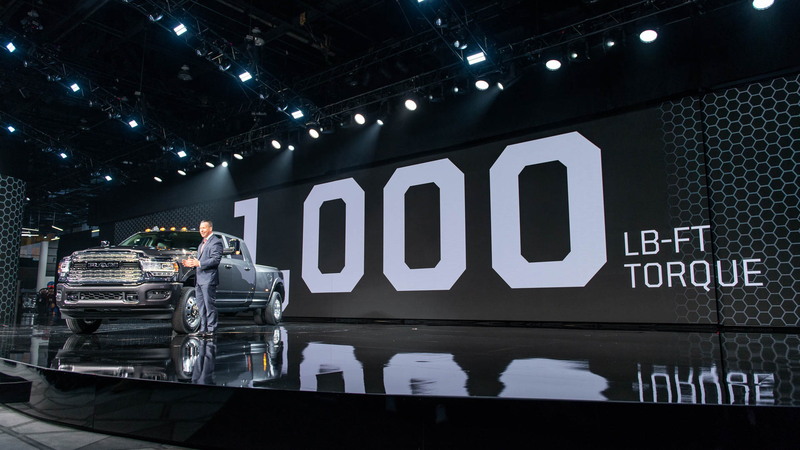 Ram crossed the barrier Monday when it announced the 2019 2500 Heavy Duty and 3500 Heavy Duty truck lineup ahead of their debut at the 2019 North American International Auto Show in Detroit. The 2019 Ram Heavy Duty lineup is all about the numbers, and most of them are ridiculously big, not to mention class-leading. 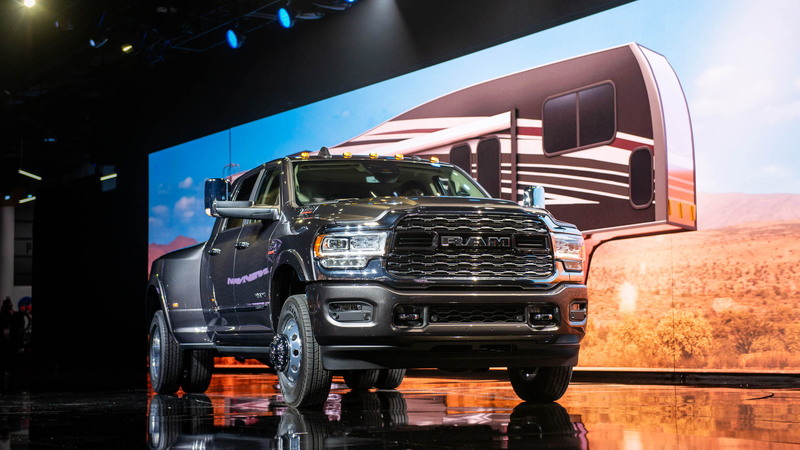 The 2019 Ram HD can tow up to 35,100 pounds, haul up to 7,680 pounds of payload, has up to 410 horsepower with the gas or 1,000 lb-ft of torque with the high-output diesel engine, and lost up to 143 pounds of overall weight. 2019 Ram Heavy Duty buyers will have a choice among three powertrains: a 6.4-liter V-8 with 410 hp and 429 lb-ft. Those that need more power can opt for a 6.7-liter Cummins inline-6 turbodiesel with 370 hp and 850 lb-ft of torque or the outrageous high-output version of that engine huffing 33 psi of boost to produce 400 hp and 1,000 lb-ft of torque. Rear-wheel drive is standard while four-wheel drive is available. The gas engine is hooked to an 8-speed automatic transmission, while the diesel's only option is a 6-speed automatic. Opt for four-wheel drive and a BorgWarner part-time transfer case will shift either electronically or manually depending on model. All of this sounds impressive—and it is—but it's important to note that the turbodiesels will not send that much torque to the rear end in the first few gears; the driveline would grenade itself. In a bid to make the 2019 Heavy Duty stronger and lighter, the automaker used mixed materials. The hood is made from aluminum while the frame is comprised of 98.5-percent high-strength steel. 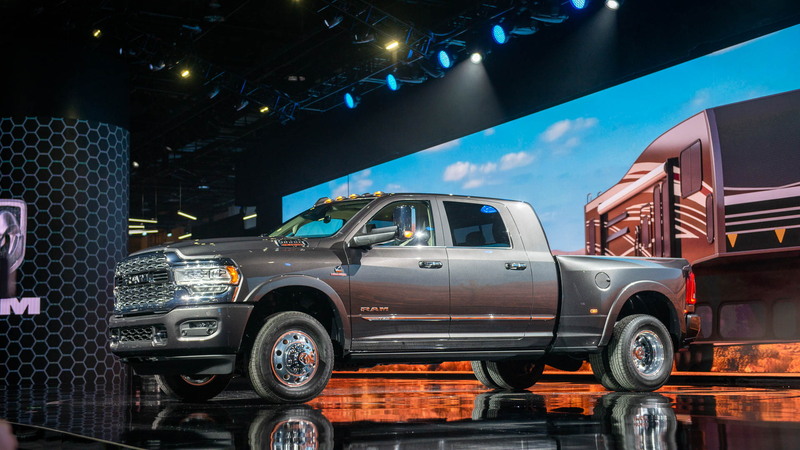 Heavy Duty buyers will find many choices with the 2019 Ram Heavy Duty. 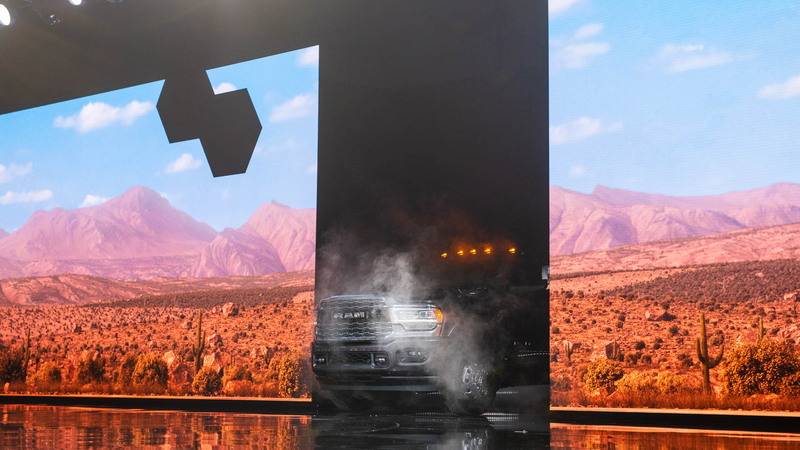 The massive hauler will be available as four-door Crew Cab, massive four-door Mega Cab, and two-door Regular Cab with the choice of 6-foot-4 or 8-foot bed. Opting for the Regular Cab automatically nets the 8-foot bed while the Mega Cab has the shorter 6-foot-4 bed. Ram proudly claims best-in-class capability with up the ability to tug up to 35,100 pounds and haul up to 7,680 pounds in the bed. These numbers are indeed class leading, for today. Both beat the current class leader, Ford's Super Duty, by 100 and 40 pound respectively. For anyone who's taken a look at the 2019 Ram 1500 lineup's interior, the 2019 Heavy Duty lineup's interior will look familiar. 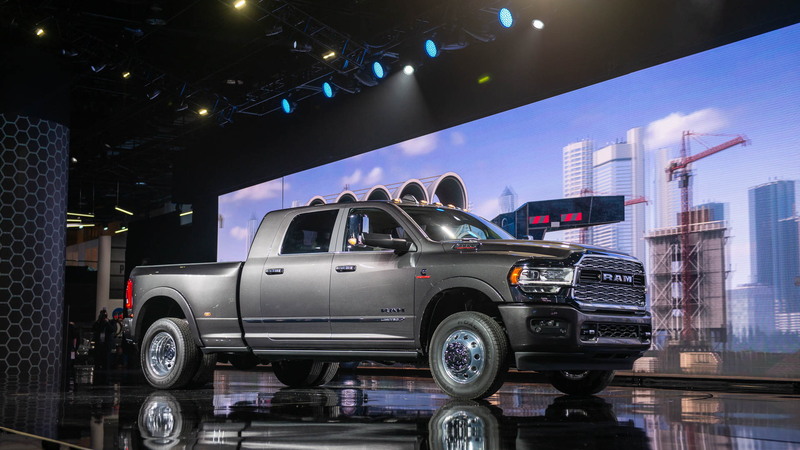 That's because Ram designers essentially dropped the light duty truck's interior into the heavy duty with a handful of tweaks for the larger application. The Light Duty truck's trick 12-inch touchscreen infotainment system is available in Power Wagon, Laramie, Laramie Longhorn 2019 Heavy Duty models. That's not all. Full LED headlights, leather-lined door panels, dash trim, and seats, real wood trim in the cabin, active noise cancellation, rear air suspension, and a 750-watt 17-speaker Harmon Kardon sound system are all available. To keep things powered on the go there are five different USB ports, including USB Type-C ports for high-speed data. Trucks that don't sport the massive 12-inch touchscreen will either feature an 8.4-inch screen or 5.0-inch screen. Apple CarPlay and Android Auto compatibility are standard on 12- and 8.4-inch versions. Just because the Ram Heavy Duty is meant to work for a living doesn't mean it skimps on available safety tech. Automatic emergency braking, adaptive cruise control, blind-spot monitors, parking sensors, surround-view camera, and a tire pressure monitoring system that can read up to six tires on the truck and 12 trailer tires are available. Ram hasn't said how much the 2019 Heavy Duty lineup will cost when it goes on sale later in 2019, but the lineup will consist of the Tradesman, Big Horn, Power Wagon, Laramie, Laramie Longhorn, and Limited trim levels (Texas gets a Lone Star trim based on the Big Horn).